Emys orbicularis is a species, which needs two different habitat types. It requires aquatic and terrestrial habitat. This species can only feed in water, so it is completely dependent on water bodies. This species inhabit smaller and bigger ponds (50-5000 m2) with submerged and floating plant cover in Lithuania, Poland and Germany. 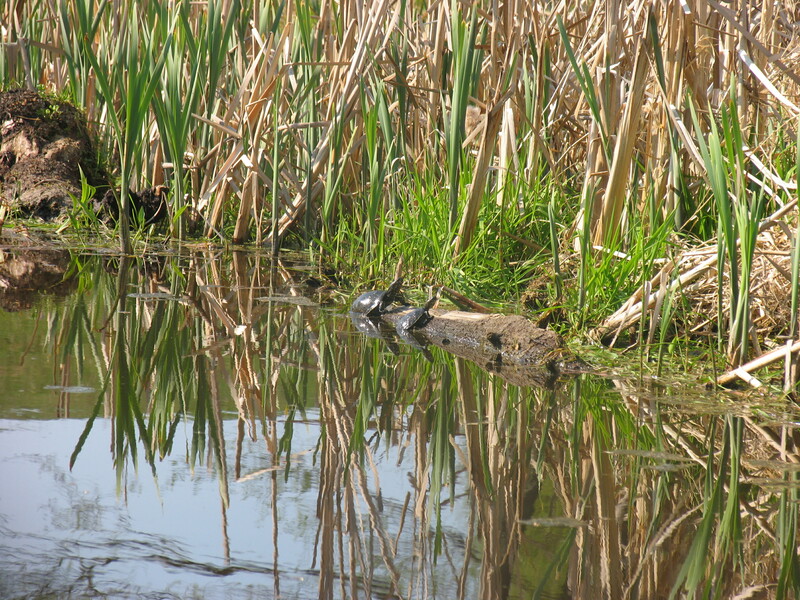 While turtles hibernate in small areas close together, in late spring and summer the individuals spread upon different ponds. 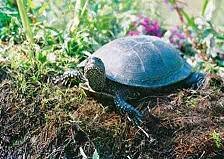 Consequently, if the water bodies are not suitable for the whole year, turtles move to different ponds in summertime. Therefore pond systems with different types of ponds are very suitable for Emys orbicularis. 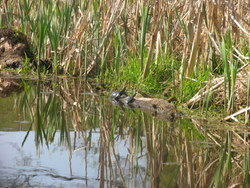 In the water bodies turtles need sun exposed places for basking e.g. deadwood or at the shore. Basking is an important behaviour and the occurrence of suitable basking sites can be a limiting factor in the northern species range. Emys orbicularis feeds on invertebrates, amphibians and their larvae and on plants. In March or April after hibernation the turtles start with mating period. 4 up to 8 weeks after mating the nesting season begin in the End of May and lasted 2 or 3 weeks up to the Middle of June. In this time females leave the water bodies and move on land up to several kilometers for finding a suitable nesting site. They need open, south exposed, sunny areas with sandy ground for egg laying. Usually, females reproduce once a year and produce an average number of 12 or 13 eggs. The availability of suitable nesting sites is especially in the northern distribution range of the species a critical factor for species survival. The duration of incubation depends on weather conditions and lasts about 3 month. In the End of August or in September hatchlings leave the eggs. Some of them leave the nests, too, but most of the hatchlings remain in the nest cavity during the first winter and hatch in spring or early summer. In cold summers with low temperatures the development of the embryos is prolonged or even embryos can die off. After leaving the nests hatchlings walk to water bodies. The juveniles are not good swimmers and divers, so they need to stay in shallow, highly structured areas during their first weeks of life. The occurrence of suitable ponds for hatchlings (without predators, good water temperatures and good food resources for a fast growth) can be a critical factor, too, because the northern populations of Emys orbicularis have a lower reproduction rate than the southern populations and the survival of northern the juveniles is more important for the viability of the populations than in the southern regions. Nearly everywhere populations are declining, mainly due to anthropogenic habitat deterioration. Hence, conservation measures are in urgent need all over its range. In Lithuania Emys orbicularis is a rare and threatened species. Most of the 30 known populations occur in the southern part of the country. In the first half of the 20th century the species was found dispersedly all over the country. The population has declined mainly due to a loss of suitable ponds and nesting sites. While meliorations and drainages have destroyed a lot of wetlands, overgrowth has reduced the number of available ponds and open slopes for nesting. In Poland Emys orbicularis is an endangered species, primarily due to the draining of wetlands, flood control of rivers, and urbanisation of natural habitats. In Poland, Emys orbicularis is under full protection since 1935, but protection measures are insufficient. Detailed data are lacking, but Emys orbicularis was apparently much more abundant in the late 19th and 20th century. At present, only one single large population exists in eastern Poland. In Germany, Emys orbicularis is in danger to extinct. Populations collapsed or were wiped out by the end of the 18th century as a result of habitat changes (e.g. effects of succession), overexploitation for food, and fishing. New serious threats for the surviving relict populations in northeast Germany arise from changes in agricultural and forest utilization in the 20th century. Numerous water bodies and marshes were drained, and nesting sites were cultivated. Only a few recent populations are confirmed in Brandenburg and South-Mecklenburg. © 2006. Lithuanian Fund for Nature. All rights reserved. Webmaster: webmaster@glis.lt.